Blue Eyeshadow.. As much as we love to look at the bright blue or a deep navy color in the form of eyeshadow, I have to say it's not easy to wear it on a day to day basis. Especially for those who just about to get the hang to the love of makeup, blue is like the magical color. You want it, but you know you wouldn't wear it. We've all been or maybe in such a dillema. Now, I've been playing with colors ever since I got to work and I am more adventurous in terms of using a bold lips or bold eyes when meeting people. Usually I just play with it in my room, took some pictures and then proceed to wipe it off immediately before anyone noticing (But my family has gotten used to see me wearing half eye full of makeup tho). 1. Prepare your lid with some base makeup and an eye primer. 2. Fill in your eyebrow lightly and softly, I recommend using a brow powder so it'll show up softer. 3. 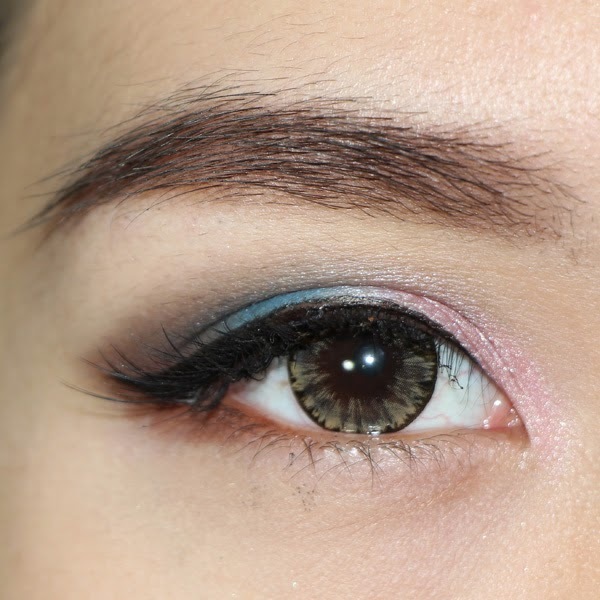 Use a shimmery pink eyeshadow to the inner half of your lid. Putting it all way up until above the crease and inner corner. This will help to open your eyes and make it more romantic. 4. Take a matte sky blue color and put it right beside the shimmery pink but leave the outer corner untouched so we can get the best color pay off on the brown we're about to use. 5. With a neutral dark brown, define the outer corner and blend the harsh edges on the crease from the blue and pink shadows. I'd like to shape my eyeshadow to a point because my eyes are droopy and this helps me to get a fresher looking eyes. 6. Drag the brown into 1/3 lower lash line to balance it out. 7. Use a brown eyeliner, make a thin line and flick it on the outer corner to give a extra romantic look. I use a brown color to ground the look to a more neutral side, if I use black I think it will be too strong for a day look. But, suit your need, ladies & gentlemen. 8. Curl your lashes, add a shitload of mascara, and give an extra oomph by using a demi lash. And there you have it! 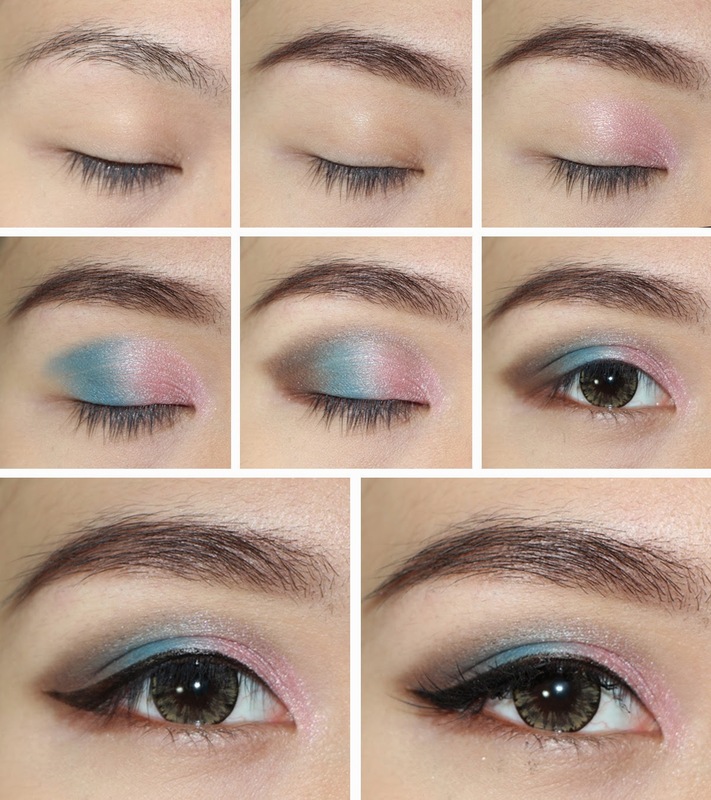 A sweet & romantic eye look, appropriate for daily use! What I like about this look is that the blue is kinda hidden in the lid while you open your eyes but it will show up beautifuly when you wink. And we wink a lot! It's a nice look for an everyday neutral wear, or even for a date. It's not a heavy look but it gives you a small kick for a more brave and confidence since you realize you wear something different yet it so subtle, you'll feel like you've past another milestone in makeup. It's the small achievement you make everyday that keeps us alive, isn't it? 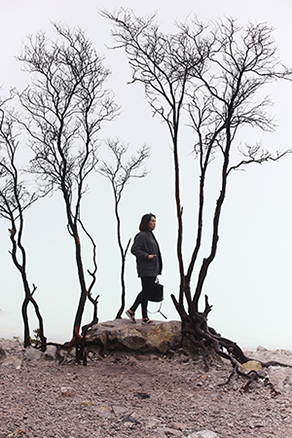 Keep stepping on those milestone and before we can realize we've reached that thing we always wanted. 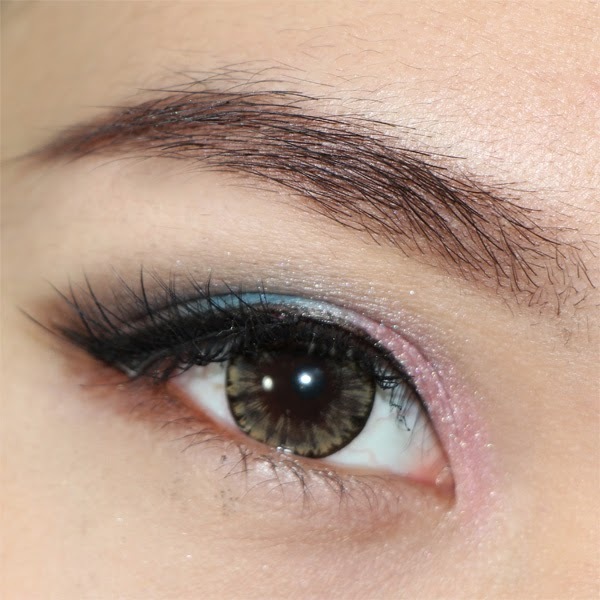 itu brown eyelinernya merk sariayu? btw dulu aku follow blog kamu via GFC tapi sekarang ko gapernah muncul di dashboard lagi yaa kirain memang lagi jarang ngeblog.. T_T follow ulang ah..